The morning of day 3, James said he had no particular place he wanted to go, but he was visibly less than excited when I told him I wanted to start the morning in the St. Clair River. He had spent much of day 2 in the river and caught nothing. I could understand based on my own confusing experience of the first two days, but my plan was to start deep on a spot Wayne helped me with prior to the cutoff. was not working now for me. I don't know why. It just wasn't. But I figured the deep bass would not affected as much by the same thing. 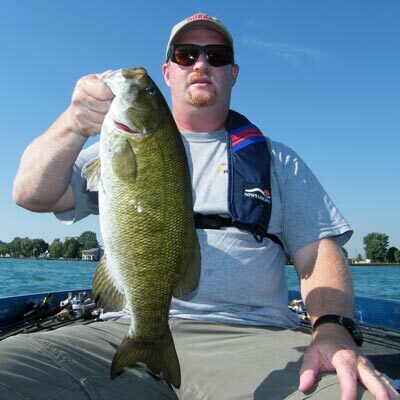 Since my Anchor Bay bass were not biting well until late morning, it was something to try. And you never know when those big river bass will start whomping your lures again! 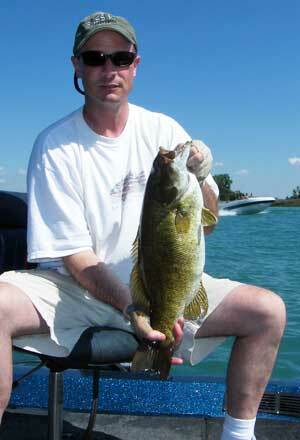 I'd been catching big bass from 4 to 40 feet, but hadn't really tried a lot of 22 foot or deeper the first two days. I'm not a huge fan of drifting and dragging or vertical jigging, but I can't argue the effectiveness at times. It just puts me in a coma when it is slow verses casting to spots - my preference. So, after a couple stops to get my bearing in the overcast low light of our start and the rain and some spray in my eyes - believe me, I was not running at speed - James and I made it into the North Channel via the Middle. We stopped at the nonboater into the river community spot for a quick hit (indicator check) I asked to please not take a dive today as my 2nd day partner had. He promised not to. James immediately caught a small largemouth on a shallow crankbait. More of the same - largemouth bass everywhere right now. He was much happier about the river when he caught a nice greenhead over 2 1/2 pounds. Really got our day off to a better start relieving his concerns despite no big smallies being home.